Songs and their Photos - my year end list. About a week ago, I decided to revisit my old tradition of ranking albums and songs of the year. I had barely started before I realized the reason that I stopped - it was really difficult to put things in a specific, justifiable order, especially when I wasn't making any contribution to go along with what can only be labeled as criticism. So, instead, I decided to do this: here are some songs I liked a lot this year, in no particular order. Each one is paired with a photo I took that went along with my interpretation of the song in some way. It's just a thing I'm trying out. Amanda Palmer and the Grand Theft Orchestra - Smile (pictures or it didn't happen) - I came up with this entire project while listening to this song, so it deserves to start it off. I took the picture out the window while driving around Grosse Ile, for the simple reason that I'd never been on that island before. John K. Samson - When I write my master's thesis - This entire album is fantastic, but I went with this track to showcase the wonderful fact that I have a new job in this very building, which I love, and it is in part due to the fact that I completed my master's degree this year. Beach House - Lazuli - I didn't mean to end up in this spot behind the train station, but when I took this photo freehand and got the leading lines and symmetry nearly perfect, I knew it could only happen in an 8-bit world. So, an 8-bit song off of Bloom, which was wonderful, fit perfectly. Important note -- I'm not a big fan of showcasing ruined pieces of Detroit, but this photo came out too good. Sorry. Benjamin Gibbard - Shepherd's Bush Lullaby - A picture of rain to go with the frontman of DCFC? Look, I'm not trying to be subtle here, and I'm a sucker for a capella. I was driving home with the camera on the passenger seat, decided to snap quickly, and it worked out okay. The Gaslight Anthem - National Anthem - While a lot of the songs on Handwritten made me feel younger, this is a track that I can count on enjoying when I am older than my grandfather. I'm not talking staying power, I just feel emotionally connected to the melody. The Mountain Goats - Amy A.K.A. Spent Gladiator 1 - This is one of the tags I'm used to passing on the way to and from work. I don't know that I understand graffiti, but it seems to fit into the message of this song: "Do every stupid thing that makes you feel alive." Taking pictures of tags in lousy neighborhoods makes me feel that way. Guess I'm lame. Craig Finn - Balcony - I'm wasn't in a highrise when I took this. But you know what? That doesn't matter, because this song is incredibly non-bitter while being hilarious about the choices people make about who to be with, so downtown Royal Oak could fit the story well. Walk the Moon - Anna Sun - The original plan for this photo was to take the selective focus picture from inside the doorway. That didn't work out because someone (the owner of the boots) was inside using the shower. Wander into abandoned houses for the sake of photography might be a terrible idea. The Tallest Man on Earth - 1904 - this isn't the natural disaster we were looking for, nor is it a disaster at all, but this works. I like this guy/band. This album did not knock me back, but 1904 really stood out. So, you get a photo, tall man. The Killers - Flesh and Bone - This first track off of Battle Born asks "What are you afraid of, and what are you made of?" This guy is a Detroit Firefighter, and I think his answer is clear. I chase smoke when I see it, but so did a lot of other people, so I think it's okay. The Lumineers - Ho Hey - this is everywhere, yes, but my wife and I sang it to each other constantly shortly after we bought our house this year. Here's a view of the front door that I liked. The whole place is pretty great, if you haven't seen it. Anyway, that's my year-end music post, coupled with photography. It's been a great year. Now, when using the phrase anything is possible, it should be gathered that at some point or another, people are going to be critical of the semantics. I’m so certain that you are aware of the particulars that I present to you the following reply to one person speaking such a phrase, undoubtedly submitted by at least one dissenter in the audience. 1. Lock eyes with the purveyor of condescending language. During all subsequent instructions, keep this one a constant until such time that (inevitably) it is no longer possible. 2. Attempt to make yourself taller in any way possible. Beyond simple tip-toe stance, use a stair or inconspicuous wooden box, or even pull a far shorter person (willingly) behind your right shoulder. This common intimidation method has been used for centuries. 4. Without a focus on truly unhinging, open your jaw as wide a possible. It is important to remember that if such a thing was dangerous, it would not be part of the procedure of a routine teeth cleaning. 5. Relax the throat muscles. Imagine you have accidentally swallowed a large jawbreaker, and follow through with the same motions your body would automatically take in an effort to avoid asphyxiation. 6. Lean in toward your verbal assailant with the last moments in which eye contact will be possible. Rattling your diaphragm will allow for a roar to escape your lungs, but under no circumstances should you move your tongue or relax your jaw; both are imperative for the paralyzing fear that is keeping your target in place. 7. Swallow the head of your opponent. 8. Allow for your upper body to slowly and completely return to normal, as rushing may cause dangerous cramping. Slow your breathing gradually as it may have increased to oxygenate your blood faster, which by the way, has been pumping at super-human levels. 9. The stretching of your lips may have caused chapping, so apply a lip balm immediately to keep painful dry spots from developing. Do not lick your lips; it looks tacky due to the events that have just transpired. By paying mind to these simple steps, you may find yourself able to overcome the comments that a more functional human being would have simply moved past. If you would like to acknowledge societal norms, act as a mature adult, and be a productive member of society, skip steps 2 through 9, and then move on with your life. Photo credit: @coolestkmayer, originally, but now she's @KarMaGoBlue. Published on the Tumblr on 02/06/2012, and by far one of my favorite posts that I made there. Sorry for the multitude of older posts recently -- keep on the watch for a big project I've been working on lately to show up sometime next week with all new content. 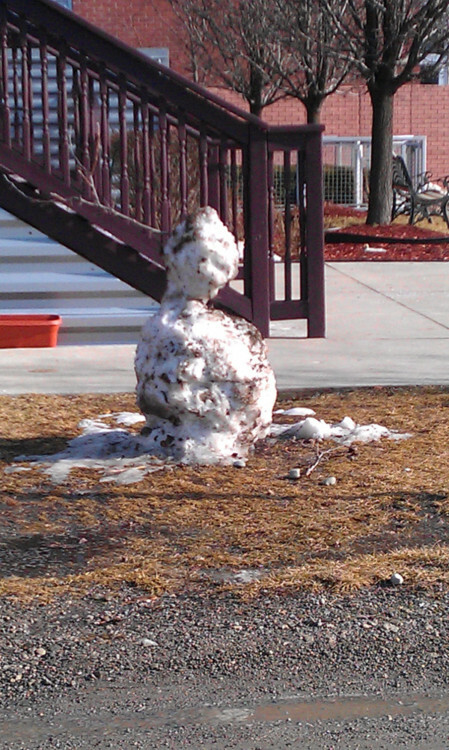 A melted snowman is not the visage of Ozymandias, but they mean the same thing. Who were we to be so arrogant that we tried to make a man of this miracle that fell from the sky? These crystal, individualistic as they are fragile, came from above preformed and perfect, and our response was to shape them into a bastardization of our own image? Shame on us. We must always believe that we can immortalize ourselves with items we simply did not appreciate in their own form, despite its overall ability to be perceived as perfect. Nothing we make can be as great as the original elements, can they? But we try it anyway. Sure, a painted picture is more beautiful than the individual tubes of acrylic, but is it as beautiful as the woman crushing flowers and water to create the first version of that violent, crimson paint that catches your eye first? A professor instruction on the manner in which it pops from the page would do well to think of her centuries-old contribution to the canvas. You’re great, trust me. But you’re still a collection of elements, forged in a star that could liquefy you the same way it did your creation. Appreciate it, appreciate yourself, and try and see the world by itself, and not your mirror. Not every electron was made to spin the same way. Photo credit: @hemogoblins. Originally posted on the tumblr on 01/31/2012, at which time it was called "57 on 1/31," referring to the unseasonable warmth that decayed the filthy snowman that Kari spotted. Vicki sighed and sipped her melting drink, considering what her grandmother would say about this situation. Etiquette dictates that the man should have sat toward the sun, not you she would have cried with a wince. Now Vicki sat with her version of that hereditary wince, wondering why she hadn’t brought sunglasses on a summer walk. The sun’s rays kept her from looking up at Jonah without narrowing her eyes, so she continually averted her gaze. That, of course, was a sign of sorts — not one he picked up on in a good or bad way, but one that brought Vicki to consider the problems in their relationship. Using her straw to mix the remaining whipped cream with the blended drink, she decided to try and break the silence. with a fight. “No. You’d probably get shot anyway.” Vicki’s straw drew in air awkwardly at the bottom of her cup, and she was no longer able to keep up the charade. She burst into laughter. Photo Credit: Jackie Z; story originally posted on the tumblr, 08/31/2011. Over the next several days, some scheduled posts that I've migrated from the Tumblr will be going up. I'll be on break for a few weeks starting Friday afternoon, so at that point I'll be working on a big project that'll involve all new photos. Please keep an eye out for that, and pardon the "best-of" collection if you've seen the next few stories and photos before. If you haven't, please enjoy! Friday morning's post is one of my favorites ever, and the idea I'm working on right now will be a gem as well, if it goes according to plan. I'll keep creating new content, and just know that I appreciate the opportunity to share my work with you. I didn't want to make an announcement post without a photo, so I've included a goat I met on Father's day. Enjoy. I don't live in Downtown Royal Oak anymore -- the wife and I bought a house in Clawson just a couple months ago. But, over the past year, I've played with the lighting a bit and gotten a good view whenever possible from the multiple parking structures in the city. The last one was a bit haphazard while I drove about, but I ended up liking the sky that evening.